The firm works on exciting and innovating affordable housing and community development projects. Examples of a few recent projects we have worked on are included here. Please contact us for a comprehensive list. Located three blocks south of Sloan’s Lake, a Denver, Colorado landmark, “Vida at Sloan’s” is currently being developed by the Denver Housing Authority (DHA) as a 170-unit senior housing project. The development includes all housing plus a ground floor health clinic and senior activity center within a single building. The project’s vibrant future community will be focused on healthcare services and quality senior living at the former site of St. Anthony’s hospital, a designated “redevelopment area” that has quickly been converting to market rate housing unaffordable to many seniors. The project was awarded both 9% and 4% LIHTC and also benefits from a NMTC financing. “Vida at Sloan’s” was constructed using $65 million in 9% and 4% LIHTC financing for all housing, plus NMTC financing to construct the health clinic and senior activity center. Because all project features are located within the same building, each component needed to be condominiumized with each condo owned by a separate financing partnerships/special purpose entity. The community health clinic and senior activity center will be located on the ground floor with the 4% and 9% units built above. The rental units are 100% subsidized to offer affordable rent to senior residents with lower incomes (30-40% AMI). The 112 units (financed with 4% LIHTC) use project-based Section 8 voucher subsidy and the other 64 units (financed with 9% LIHTC) receive public housing rental subsidy. The NMTC health care clinic portion of the project was arranged as a real estate leasing “qualified active low-income community business” (QALICB) with DHA as the master tenant. The clinic will be subleased to Centura Health for a range of health services and to Fresenius for dialysis services. The senior activity center will be managed by a nonprofit entity owned by DHA. The project financings were closed in November 2017. S.B. Clark Companies assisted DHA from the beginning of the project with this complex financing structure, helping to determine the best structure for the development to maximize the tax credit leverage and considering the needs of each of the 9%, 4%, and New Markets tax credit programs. S.B. Clark Companies also assisted with the solicitation for the lender and syndicator, the LIHTC applications and finding the needed NMTC allocation and financing partners. 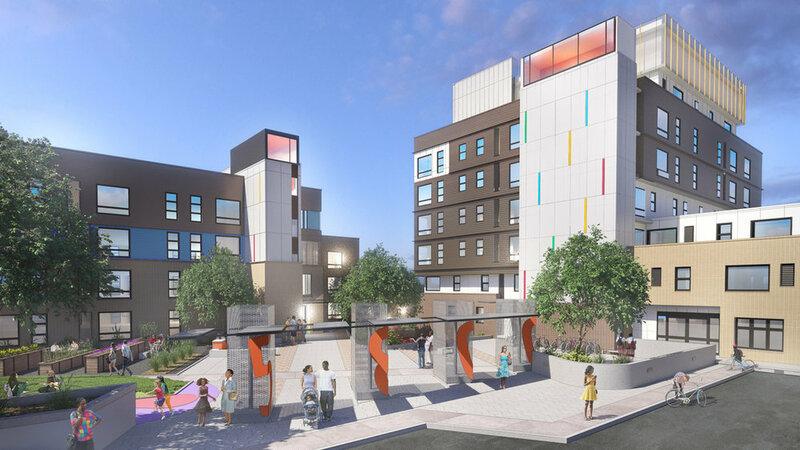 The Fifty Eight Hundred project is a redevelopment of an existing, long-vacant office tower and plaza in Lakewood, Colorado into a 152-unit affordable housing complex. The office tower was converted into 54 units and provides pre-built underground parking. The second building was newly constructed immediately adjacent to the office tower and will contain another 98 units. All 152 units are targeted toward workforce and other households earning lower or moderate incomes at 30-60% AMI and offer a diverse unit mix, from studios to three-bedroom units to accommodate individuals, couples, families with children, or other large households. Due to the location and size of the project, Fifty Eight Hundred stands to catalyze positive development in Lakewood, Colorado while providing families with affordable housing. S.B. Clark Companies assisted in structuring the $40.2 million financing using 4% Federal LIHTC and Colorado State Affordable Housing Tax Credits (AHTC), submitting the application for the Federal LIHTC and State AHTC, soliciting the private activity bond (PAB) purchaser and tax credit investor, and assisting through financial close. Kestrel is a 190-unit development in Louisville, Colorado that combines 129 multifamily and 71 senior units in an intergenerational, mixed-income master-planned community. The project provides vital replacement housing in an area of Boulder County severely impacted by the 2013 flooding. This community is designed to promote healthy living, intergenerational interaction, and artistic elements, including artist-friendly lofts and a community art yard to facilitate public art installment and workspace. The development also includes 20 permanent supportive housing units for households who are formerly homeless or experiencing a disability, with long term supportive services provided by Mental Health Partners of Boulder and Broomfield Counties and Imagine!. Community amenities include multiple community gardens, a large neighborhood park as well as seven pocket parks, and local and regional trail connections. In 2015, Kestrel was awarded 4% Federal LIHTC and Colorado State AHTC combined with Community Development Block Grant Disaster Recovery (CDBG-DR) funding set aside for disaster relief projects. The $78 million project financing included $25.3 million in private activity bonds, a second mortgage of $1.4 million from CDOH/Colorado Housing Investment Fund (CHIF), CDOH CDBG-DR funds, and subordinate cash flow loans from Boulder County Housing and Human Services. Complications in the timing of fund availability required a complicated interim bridge loans solution. S.B. Clark Companies assisted in structuring the complex financing, soliciting the private activity bond purchaser and tax credit investor, and assisting through financial close.